DALLAS, TX--(Marketwired - Apr 7, 2016) - Parks Associates released research at ISC West today revealing that 9% of U.S. broadband households owned an IP/networked security camera at the end of 2015.1 The firm's Delivering Peace of Mind: Connected Home Devices & Sensors reports 44% of networked security camera owners access or control their device remotely on a daily or almost daily basis. The research firm is attending and exhibiting at ISC West this week, the largest premise security tradeshow in North America and one of the security industry's premier launching pad for new products, solutions, and technologies. "Safety and security are two key drivers for consumer adoption of smart home devices, and networked cameras are among the leading products with strong security value propositions," said Brad Russell, Research Analyst, Parks Associates. "We estimate slightly more than half of the networked cameras bought in 2015 are for first-time buyers, so these products are spearheading the growing adoption of smart home solutions." More than 60% of networked security cameras in U.S. broadband households were acquired through a home security system or a home control system that controls multiple devices. One-third of networked security cameras were acquired as a stand-alone product, a slight decline from 2014, when 36% of networked camera owners indicated that they purchased the product as a stand-alone device and not as part of a home control or home security acquisition. Four to five percent of U.S. broadband households report buying a networked security camera in 2015, which includes first-time buyers, replacement buyers, and additional IP camera purchases. Nearly one-half of networked cameras are installed by the owner or by a friend or family member. "Security system households are more likely to own a networked camera than non-security system households -- and by a lot," Russell said. 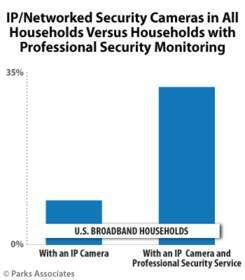 "Among U.S. broadband households with professional security monitoring, 32% also own a networked security camera. These devices can add an additional layer of protection to a system at a relatively low cost, so security-minded consumers have been good targets to market these products." Networked cameras consist of any camera that can be accessed and controlled from a smartphone, tablet, or computer. They include cameras included in wired DVR/camera bundles. The statistic also includes cameras sold by managed-service providers such as security monitoring companies. "There is a big change between network camera owners and intenders in terms of channel of purchase," Russell said. "Only 6% of current owners report that they acquired their network camera as part of a home control system, while 43% of those intending to purchase a networked camera intend to acquire it as part of a planned acquisition of a home control system." For more information about Parks Associates research or to speak with an analyst, contact Holly Sprague at hsprague@gmail.com or 720-987-6614. 1 Given the margin of error from the 10,000 U.S. broadband household survey, the range of ownership is 7-9%.